Fowey is surrounded by a beautifully rugged coastline and stretches of rural bliss, perfect for a seaside walk to soak up the views and sights that the area boasts. Whether you’d like a gentle stroll through the town, or a challenging coastal hike, we’ve rounded up our favourite walks to keep you busy and active during your stay with us. From The Old Quay House, walk north along Fore Street to Caffa Mill, a large car park where the vehicle ferry runs to Bodinnick. From Bodinnick slipway, walk up the steep lane past the Old Ferry Inn. Part-way up the hill on the right is a narrow footpath signed ‘Hall Walk’. Follow this footpath to the ‘Q’ memorial, which stands above Penleath Point and has open views of Fowey Harbour and Polruan. If you’d like to walk down to the water’s edge, there is a steep path down to the water’s edge at Penleath Point. From the ‘Q’ Memorial, the path runs high along the northern bank of Pont Pill. At the end of the wooded section, pass through the stile and kissing gate, walk along the field fence-line (on your right) for a short way before taking the right hand gate back into the woods, which drops down onto a rocky footpath. At the junction, turn sharp right, almost doubling back, and continue down to the small hamlet of Pont. Cross the wooden bridge to the southern shore of Pont Pill and continue up the path past the cottages on your right. 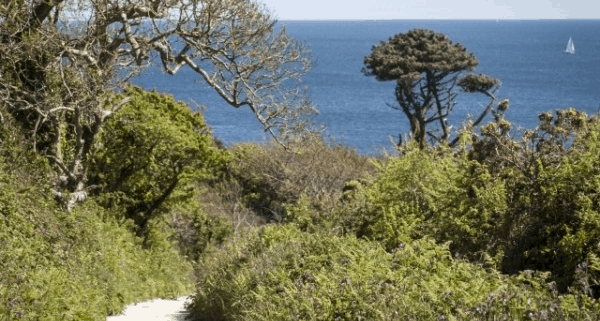 Take the first path on the right signed ‘Polruan’. Follow the path uphill through a gate into a series of fields. The path runs along the top and then through a gate into woodland. At this gate take the lower path, which you stay on all the way to Polruan. From Polruan, a pedestrian ferry runs from the quay to Fowey. In summer you will arrive at Whitehouse Quay and winter at Town Quay in Fowey. Take the foot ferry over to Polruan from Fowey. Walk up from the Quay at Polruan, then turn left along East Street, by a telephone box and a seat. Go right up some steps signposted ‘To the Hills’ and ‘Hall Walk’. Follow the path left at the next junction, then continue along this path. Keep right at the next junction and pass a National Trust sign, ‘North Downs’. Turn right at the T-junction, then in just a few paces, bear off left along a path, signposted ‘Pont and Bodinnick’. You will reach a wooden gate onto a lane, but don’t go through the gate, instead bear left over a stile. Follow the established National Trust footpath, and you will eventually descend some steep wooden steps. At the next T-junction, turn right and climb uphill. You can also go left at this T-junction to pay a visit to Pont. If not, continue on this route until you reach a lane. Go left for a few paces then, on a bend by Little Churchtown Farm, bear off right through a gate signed ‘Footpath to Church’. This is a steady climb to eventually reach the lovely Church of St Winwaloe. Turn left outside the church and follow a narrow lane. At a T-junction just beyond Pencarrow car park cross the road and go through a gate, then turn right along the field edge on a path established by the National Trust, to go through another gate. Turn left along the field edge, and at the field corner, turn right onto the coast path which leads to a steep descent. (To continue to Pencarrow Head go left over the stile here and follow the path onto the headland. From here the coast path can be re-joined and access made to Great Lantic Beach.) Follow the coast path for about 1¼ miles (2km), keeping to the cliff edge and ignoring any junctions. Where the cliff path ends, go through a gate to a road junction, which you need to cross and then go down School Lane. Turn right at ‘Speakers Corner’, then turn left down Fore Street to reach the Quay at Polruan. Then take the foot ferry back across to Fowey. On leaving The Old Quay House, turn left along Fore street and continue along the road, keeping the sea on your left, to eventually reach Readymoney Beach. Follow the footpath past a Saints Way signpost and around the back of the cove to reach another footpath signpost by the overhanging cottage. Follow the path signposted as the Coast Path past the cottages and up the valley until you reach a waymark by a wooden fence and, as you approach, a Covington Woods sign, where you need to turn left and follow the path towards the headland until the path splits. At the junction, bear left, as indicated by a sign on a slate for Gribbin, to reach a sign for St Catherine’s Castle where you’ll need keep right until you reach a fork in the path where a path to the right leads uphill to a shelter. Take the middle path ahead and follow it to a waymark. At the waymark, turn left through the gate and follow the path along the coast. Cross the stile at the other side of the field and follow the path down the steps to reach a waymark at the back of the cove. Continue ahead at the waymark to reach a stone stile. Climb the stile and follow the path up the side of the valley to a pedestrian gate, follow the path through several gates and across a gully until you reach a waymark and follow signs for Coombe Farm. Continue on the path until, through the pedestrian gate, and follow along the right hedge, past one field gate, to a second gate which you need to go through and follow the track until it emerges at a junction of tracks and lanes. Take the second right down a track following signs for Readymoney, where you will rejoin the loop. Continue along the road you originally walked along and you will return to Fowey town centre. On leaving The Old Quay House, follow Fore Street to the left, where you will reach the harbour. Continue around the harbour, keeping the sea on your left and continue along the Esplanade, where you will have lovely views of Polruan and down to Bodinnick. You will eventually reach Readymoney Cove, a little beach that has plenty of benches on which to sit and enjoy the beach and view across to Polruan. Continue back on yourself along the same route, past The Old Quay House and along Fore Street to eventually reach the other side of Fowey to the quay landing from Bodinnick. As in the beginning of Walk 3, follow instructions to reach Coombe Farm, then at the road, turn right and continue to Lankelly Farm. Pass a junction on the right and follow Prickly Post Lane for a few paces. Turn off left onto a gravel drive, then keep left and along a narrow fenced-in path. Go up a wide, rough track by derelict buildings at Trenant, then over a stile on the left. Keep walking alongside the field edge, then follow the path to a stile into a field below Tregaminion Farm. Go up the field to a gate, continue between buildings then turn right, then left, to reach a T-junction with a road by the entrance gate to the Chapel of Ease at Tregaminion. Turn right and in 100yds (91m) go left into a field. Reach a junction on the edge of some woods. (An enjoyable diversion is to take the trail to the beach and cove at Polkerris.) On the main route, keep left follow the well-defined coast path for 1¼ miles (2km) to Gribbin Head. Enter the wooded National Trust property of the Gribbin. Keep left at a junction and through a gate to the Gribbin Daymark. Go left and down a faint grassy track, then follow the coast path to Polridmouth. Follow the coast path, signposted ‘Lankelly Cliff’. At open ground, follow the seaward field edge. Go steeply in to, and out of, Coombe Hawne. Enter Covington Wood, keep left at the immediate junction, and pass the Rashleigh Mausoleum. Turn right at a junction to reach St Catherine’s Castle. Return along the path then go down steps at the first junction on the right. Go down some wooden steps and you will return to Readymoney Cove, which you’ll have originally passed through at the beginning of the walk. Then continue back along the Esplanade road to return to the centre of Fowey.